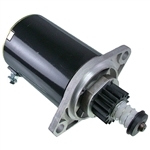 Looking for the replacement RV generator starter motor for model No. 6.5NHMFA 26115C Serial No. I 94322893? Is this the replacement motor for an 191-2132, and is this original equipment ?